Spriggans are malevolent nature spirits appearing as glowing, green humanoid females made mostly of wood. They can restore themselves to full health easily, and can call various animals to aid them in battle, even normally non-hostile creatures such as foxes and deer. Spriggans also have the ability to summon swarms of insects to attack. They are weak to fire. 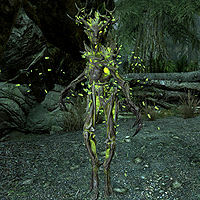 Spriggans can be an unwanted surprise in seemingly peaceful caves, as they blend in with the foliage using an invisibility spell, then attack when you pass them. Some even seem to inhabit the trunks of trees, stepping from within them when someone comes too close. A unique spriggan (base ID: xx039FDA) is kept in a cage in Tel MithrynDB by Neloth for experimental purposes. It has similar stats as standard spriggans, but is not part of any factions. Contrary to what is stated by the Official Game Guide, spriggans do not drop spriggan sap and only drop taproot. This issue has been addressed by version 2.0.0 of the Unofficial Skyrim Patch; both ingredients can be dropped when they die.